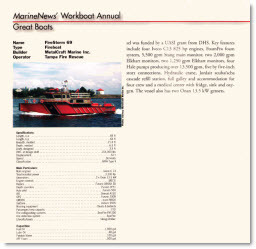 MetalCraft's FireStrom 69 has been namd the 2009 Workboat of the Year by Marine News magazine. In 2009 for the FireStorm 69. In 2002 for the FireStorm 36. In 1999 for the 65-foot Polar Barge. 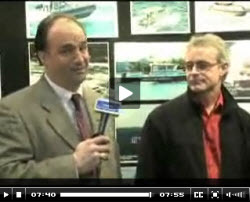 Check out this interesting and fast-moving interview by Dave Gardy with MetalCraft Marine Contracts Manager Bob Clark from the tradeshow floor of the 2009 International WorkBoat Convention which just concluded in New Orleans, LA. MetalCraft's customers report that 75-80% of rescues are in shallow water or on shores that are inaccessible by road or air vehicles. Here is video of damage to a prop-driven Portland Maine Fireboat. The story tells more about what happened. November 1st in Perth Amboy, NJ, the owner of a 44-foot cabin cruiser had just started a gasoline powered generator to run a battery charger and it caught fire. The fire extinguisher was in the forward section of the vessel so the owner elected to jump into his dingy and make for the Raritan Yacht Club instead of facing the possibility of being trapped in the forward part of the boat. 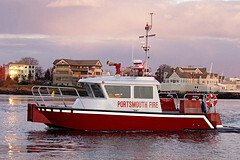 Shown here an in other photos is Perth Amboy's MetalCraft Marine Firestorm 36 responding. Update: Story from MyCentralJersey.com . 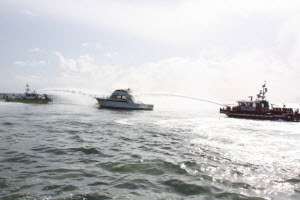 Two MetalCraft Marine fireboats respond to a 50-foot power-boat fire in Biscayne Bay in late August. Here's a writup by CBC Channel-4 and dozens of photos from the incident. 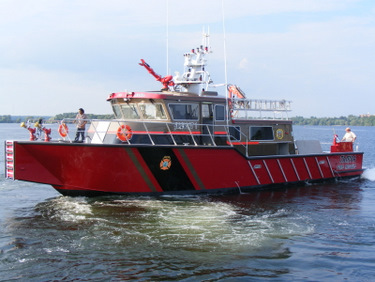 Tampa Bay Online reports that the city's newest fireboat, a MetalCraft Marine FireStorm 69, has arrived. 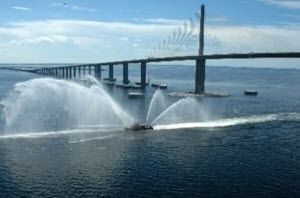 The Patriot, a 69-foot, 52-ton vessel, crossed under the Sunshine Skyway about noon today with jets of water flying 100 feet in all directions. 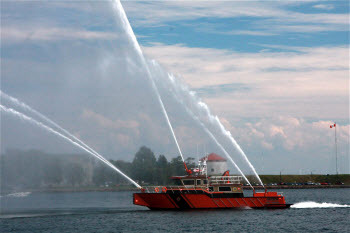 The fireboat was built in Kingston, Ontario, and cost $3.8 million � paid for with a Department of Homeland Security grant. It arrived just before 2 p.m. at Marjorie Park on Davis Islands. "It's not just a fire boat or a fire fighting resource," said Scott Ehlers, Tampa Fire Rescue's assistant chief of operations. "It is now a command and control element; it's a security element." The delivery between Kingston and Tampa Bay was not without incident. 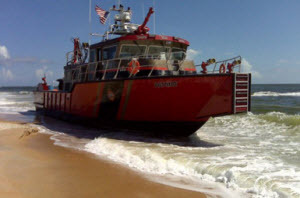 The Patriot ran aground on a shallow sandbar at low-tide near St. Augustine, Florida and required assistance to get-off. Here's an interesting YouTbe video of that experience. There was no damage whatsoever to the vessel which is designed and built for shallow-water operations. See more photos of The Patriot from its construction, launch, and sea-trials in Kingston. 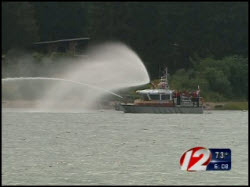 Here's a news story with video from WPRI Eyewitness News about Providence, Rhode Island's new FireStrom 30. WARWICK, R.I. (WPRI) - Securing local waterways and protecting the safety of those who use them. On Wednesday, one fire department unveiled its newest tool that will patrol the Port of Providence. This is the fourth in a fleet of vessels known as the Port of Providence Marine Strike Team. The 30 foot, jet powered m4 has a long list of features including infrared cameras, sonar to detect underwater objects a 50 gallon foam tank for chemical and other fires. She will be available to go anywhere in the state for search and rescue, evacuations and sinking vessels and she can move too, 38 miles per hour and the jets allow her to operate in as little as 20 inches of water. The half million dollar boat was paid for by a federal security grant. Here's a story, with video about the Portsmouth NH fire department responding to a massive boat-fire with their MetalCraft Marine FireStorm 30 fireboat in an upriver area that's without road access. Add saving a whale to what fireboats are useful-for. 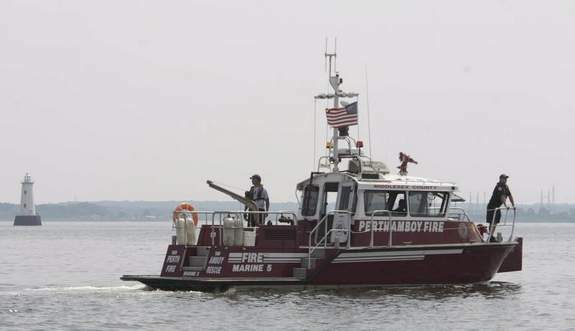 Boat crews from the U.S. Coast Guard, along with the Perth Amboy and New York fire departments, spent the next several hours following it and enforcing a protection zone around the mammal, Coast Guard Lt. Caren Damon said. The crews hoped to keep other boats aware of the situation as they waited for the whale to find its way back into the sea. But what started as a 500-yard perimeter shrunk when the whale swam into the Raritan River and headed toward New Brunswick, Coast Guard and Perth Amboy officials said. At one point it was seen swimming under the railroad bridge between Perth Amboy and South Amboy. 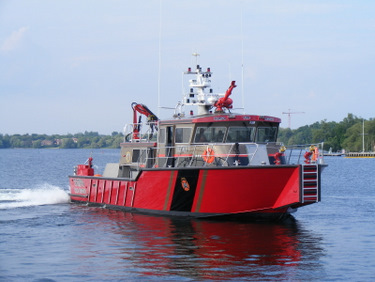 MetalCraft Marine Inc of Kingston Ontario and Clayton New York just rolled out the latest version of their award winning FireStorm-line of fireboats. The new FireStorm 69 will be the fastest fireboat in the world in the over 10,000 GPM class. 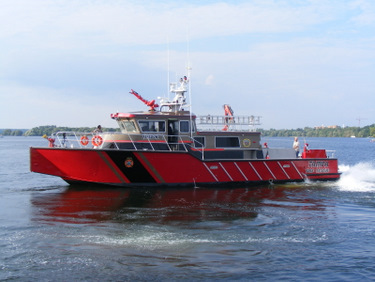 It is the first NFPA Class 2 vessel built in North America. On their way to an emergency call the 100,000 lb hull tops out at 40 Miles per Hour. Its super-low draft (28") at speed with quad Hamilton Jet drives and Iveco diesels will permit the Tampa Fire Rescue team to cross shallow areas cutting miles of travel. The presence of the craft and its state-of-the-art systems will make the port of Tampa one of the safest in the United States. All thanks to an UASI grant from DHS. medical center with fridge, sink and oxygen. The vessel also has 2 x Onan 13.5 KW gensets. The Jacksonville Florida Fire Department has a FireStorm of that size under construction now, due for delivery next summer. Here are some photos of Tampa's FireStorm 69 fireboat we've recently launched. Click to see more photos, including some taken during vessel construction. 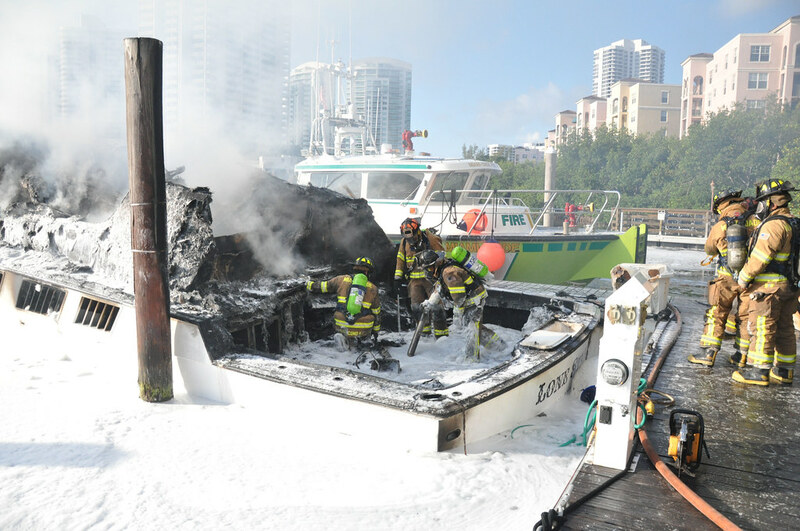 Here is news , video , and a slideshow of a fire that destroyed a large water-side residence in Miami last week. Miami-Dade's MetalCraft Marine FireStorm 50 was on scene. Fire torches two houseboats in Sausalito and a MetalCraft Marine FireStorm 30 responds to the call. Here's a video created by our customers from Tampa who were recently in-town checking on the progress of their FireStorm 70, presently under construction. 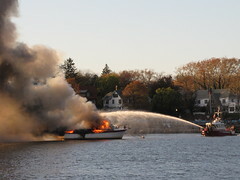 There's been lots of coverage of a four-alarm fire last week in Portsmouth, RI at the New England Boatworks shipyard. Some of you might recognize the New England Boatworks : it's famous for building high-tech large racing sailboats including several for skipper Dennis Connor over the years..
Pictured here is one of three MetalCraft Marine FireStorm fireboats that responded to the call. Here are rollover pictures for MetalCraft Marine Hull #507, a Kingston 50 being built for the Panama Canal Authority . At MetalCraft Marine, we build all our hulls upside-down, and then we roll-the-hulls-over and then finish vessel construction right-side-up. We use our outoor 70-ton crane to roll-over the larger hulls and we then attach the housings, which are built separately. This process is what's shown in the photos. MetalCraft Marine will be building four such vessels for the Panama Canal Authority over the upcoming year. City of Miami Department of Fire-Rescue has a new edition to their operations, a bright red FireStorm 48, ready to respond to waterborne emergencies within City of Miami waters as well as the overall region covering the Miami Urban Area Security Initiative (UASI) under U.S. Department of Homeland Security. 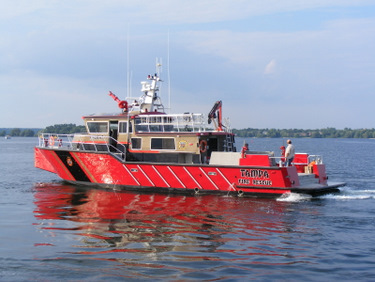 Deputy Fire Chief Brad Dougherty and MetalCraft Marine worked extensively and collectively in the design and construction of the new FireStorm 48. The custom designed boat is powered by twin Iveco C-13's 770 hp @ 2300 rpm and 364 Hamilton jets putting out speeds of up to 37 knots. Twin Darley 1750 fire pumps provide an impressive water flow approaching 4,000 GPM. 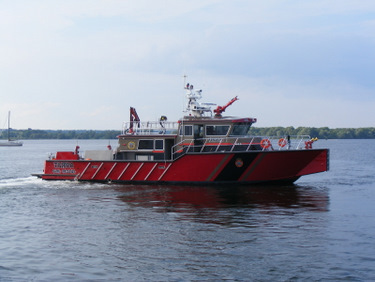 The Vessel is also equipped with the Hamilton Jet - Blue Arrow system, a high level integrated operational control system between the water jets, gearboxes, engines and helm station. There are multiple levels of redundancy for safety. The highlight of the system is the "MouseBoat" maneuvering controller. A mouse similar to the mouse for a computer is shaped like a boat and located on a pad at the console. When the MouseBoat is moved in any direction, the boat will react accordingly for ease of maneuverability. 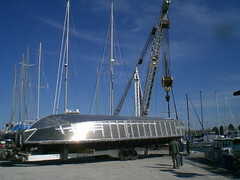 Additionally, the vessel is equipped with extensive operational components and electronics. Some examples include: NVTI stabilized optics consisting of High Resolution Thermal Imager, High Resolution 432X Zoom Color Camera, Ultra Low Lux Day/Night Camera integrated into Furuno large screen stations with Radar/Tracking, GPS Chartplotting, Dual Frequency Sonar/Sounder; Weatherfax; VHFs; Color Cameras covering engine room, decks and underwater; Underwater Lighting; Integrated Alarm Monitoring for vessel systems; 800mhz radios. Fire Chief William Bryson and the Department are extremely pleased with the new arrival and look forward to providing increased levels of Fire-Rescue emergency services to the community and region. And there's compelling video too, from ABC's JustNews.com. 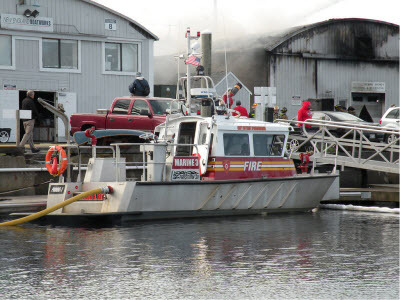 Two MetalCraft Marine fireboats were on the scene (large photo). 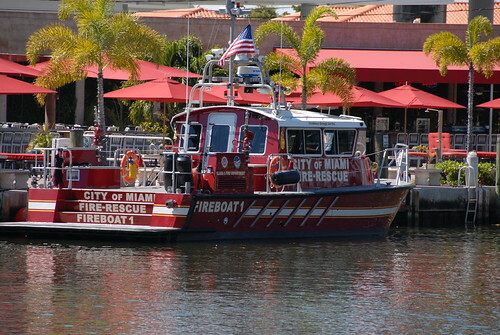 The red fireboat on the left is a FireStorm 48 belonging to the City of Miami. The margarita-lime fireboat on its right is a FireStorm 50 from Miami-Dade County. 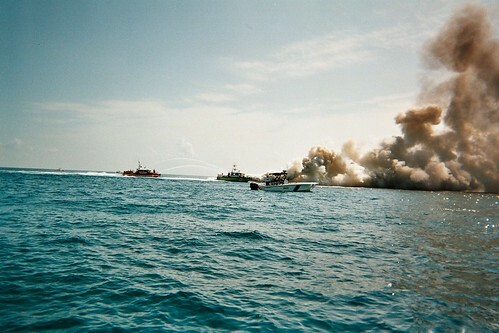 Also see 4 jump to flee burning yacht in the Miami Sun Sentinal. Here'a a great video from CBS Channel-4 in Miami about Miami-Dade County's MetalCraft Marine-built high-speed fireboats.